June, 2004 - Are You Ready for FIELD DAY? Most popular Field Day Logging Programs incorporate CW Keyers and Voice Keyers which will also enhance your FIELD DAY score. RIGblaster pro, Plus and M8 are ideal Radio to Computer Interface units to facilitate these functions. Note RIGblaster M8 has been reduced from $109.95 to $89.95 making it, now more than ever, a great buy. PSK31 is becoming a very popular mode for FIELD DAY. Remember those PSK31 contacts are Digital contacts and Digital contacts count two points each whereas Phone contacts count as only one point each. Even the special FIELD DAY bulletin is transmitted by W1AW in PSK31. 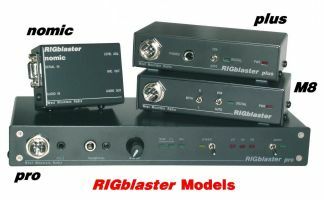 RIGblaster nomic is an ideal Radio to Computer Interface for a Dedicated PSK31 FIELD DAY Station. It requires no power and takes up very little space. This New tool from West Mountain Radio will help make sure ALL your FIELD DAY Stations are equipped with properly installed Anderson® Powerpole® connectors allowing for quick setup, tear down and emergency swap outs (if necessary). High performance Powerpole® crimp tool for a reasonable price. Crimps all three sizes of Powerpole® contacts; 15, 30 and 45 amp. Ratcheted mechanism assures proper crimps every time. Contact positioner holds contacts correctly while crimping. Far faster and better than soldering. The highest strength and the lowest resistance connections possible. Long high leverage handle makes even 45 amp 10 gauge crimps easy. The PWRgate PG40 safely connects both a Power Supply and a Battery to your FIELD DAY Station insuring you will not miss anything or loose your working frequency while the generator is being refueled. The PWRgate PG40 is rated at 40 Amperes, adequate for most FIELD DAY Stations. Sealed lead acid batteries in both Gelled Electrolyte and AGM (absorbed glass matt) types, perfect for FIELD DAY fail safe operation. Maintenance Free so they will be ready for FIELD DAY 2005. Will run a FIELD DAY Station much longer than it takes to refuel the generator. When used with a PWRgate PG40, will provide "Seamless" cut over both when the generator goes OFF and when it comes back ON. Perfect for Class A Battery or Class B Battery FIELD DAY Operations. Takes a Group 24 Battery like our Gelled or AGM Batteries above. This kit is designed to provide fuse protection to the positive lead from a Battery or Power Supply so that everything you bring to FIELD DAY goes home in operational condition.